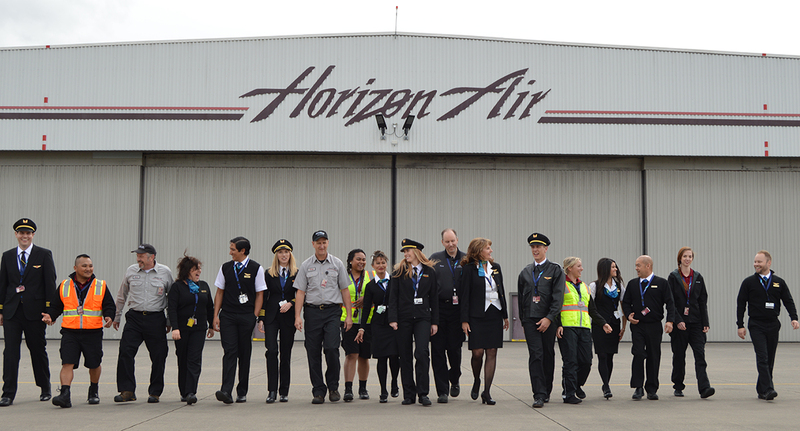 This week, Horizon Air is celebrating the 35th anniversary of its inaugural flight on Sept. 1, 1981. Although Horizon Air and Alaska Airlines remain separately managed to this day, the two companies have been closely linked for nearly 30 years. Both are subsidiaries of Alaska Air Group, and all Horizon flights are marketed and sold by Alaska. Since 2011, Horizon’s Q400 aircraft have featured Alaska’s familiar livery with the Eskimo on the tail. Passengers board Horizon Air’s first flight in 1981. When it launched in 1981, Horizon was one of hundreds of new air carriers to pop up around this time in response to the Airline Deregulation Act of 1978. Many large airlines discontinued shorter routes across the U.S. in response to the act, creating a gap in the market that many people were eager to fill. One of those people was entrepreneur Milt Kuolt. 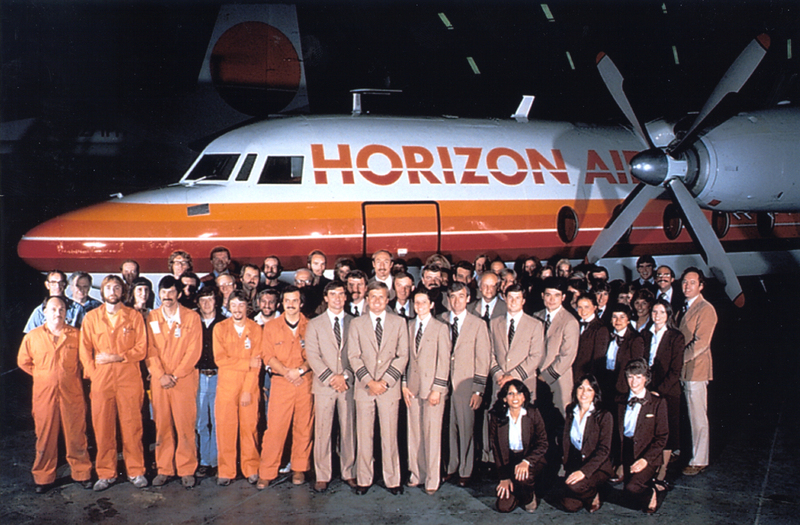 Original employees of Horizon Air. Throughout its history, Horizon has sought out innovative ways to make the flight experience more comfortable and convenient for its passengers. For example, when the small cabin and zero overhead storage on its Metroliner aircraft created challenges for carry-on baggage in the 1980s, Horizon began offering a planeside cart where travelers could drop their bags before boarding. That feature – eventually coined “A La Cart” – has become a favorite of travelers and is still widely used across the regional industry today. That can-do attitude has been Horizon’s calling card from the beginning, with employees taking pride in doing whatever it takes to get the job done. Jim Cook, the manager of Horizon’s Redmond/Bend station, recalls those unconventional early years. Horizon has never stopped pursuing new ways to make flying more enjoyable and convenient for its passengers. 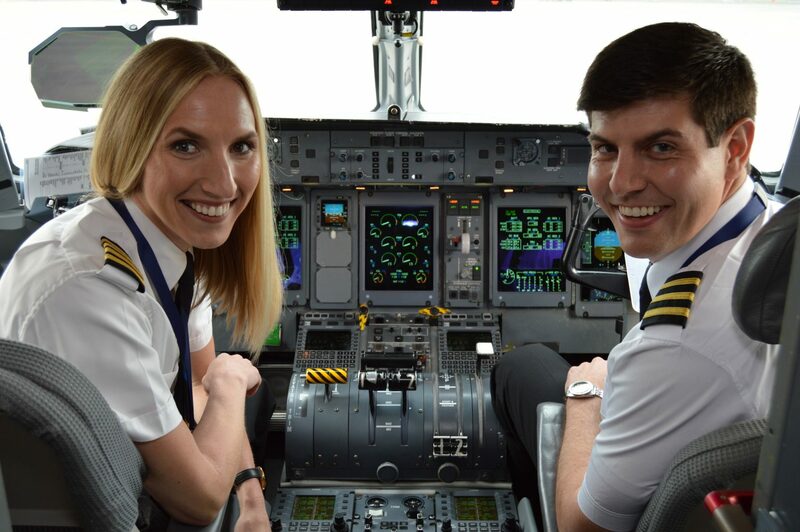 The flight operations team has helped pioneer turboprop flight deck technology that makes landings possible under lower-visibility conditions. Horizon has also tried to do its part to be a good neighbor to the communities it serves. The company was a trendsetter in the world of recycling, implementing a program for responsibly disposing of inflight service items as far back as the early 1980s. And its Q400s are as green as they come: They use 30 to 40 percent less fuel and produce 30 to 40 percent less carbon emissions than a comparably sized regional jet. 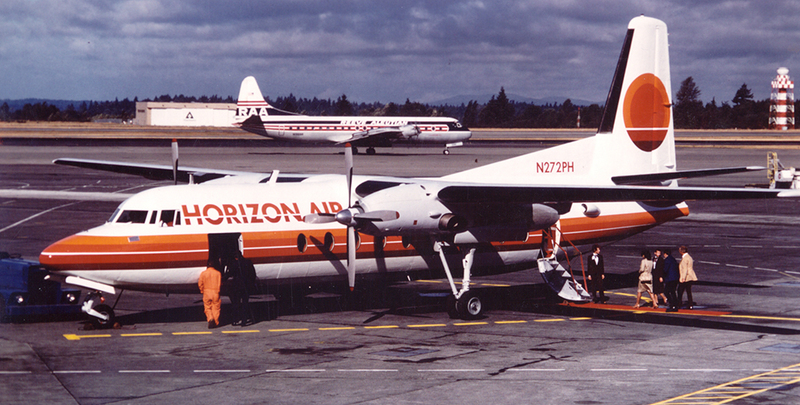 During its early years, Horizon grew quickly thanks to the acquisitions of two other regional carriers: Air Oregon (in 1982) and Utah-based Transwestern (in 1983). But it was a partnership with a third airline that eventually secured Horizon’s future. In the mid-1980s, financial success was elusive because of the fiscal challenge inherent in the regional airline industry. But in December 1986, Alaska Air Group acquired Horizon, providing financial stability to the smaller carrier while giving the larger one valuable regional feeder traffic to its flights. Many of Horizon’s technological innovations have come in collaboration with Alaska. Horizon and Alaska were the first U.S. airlines to sell tickets on the web and offer online check-in. The two carriers also introduced airport kiosks that make checking in at the airport a breeze. Horizon’s past is rich, but its future is also bright. In April, the company placed an order for 33 new Embraer E175 jets, which will allow Horizon to begin serving routes too far for its Q400s to fly. These jets will come with three classes of seating (first, premium and main cabin) and all the in-flight amenities travelers have come to expect, such as in-seat power outlets and Wi-Fi. In short, Horizon will have an inflight product that’s fully commensurate with the level of service its employees already provide to passengers. To handle this influx of jets, Horizon will soon be ramping up its hiring. As it does so, it will seek to hire those deemed “Horizon people” – friendly, hard-working and passionate folks who will help maintain and build on the unique company culture established more than three decades ago. Interested? Join Horizon’s talent pool today at horizonair.jobs. 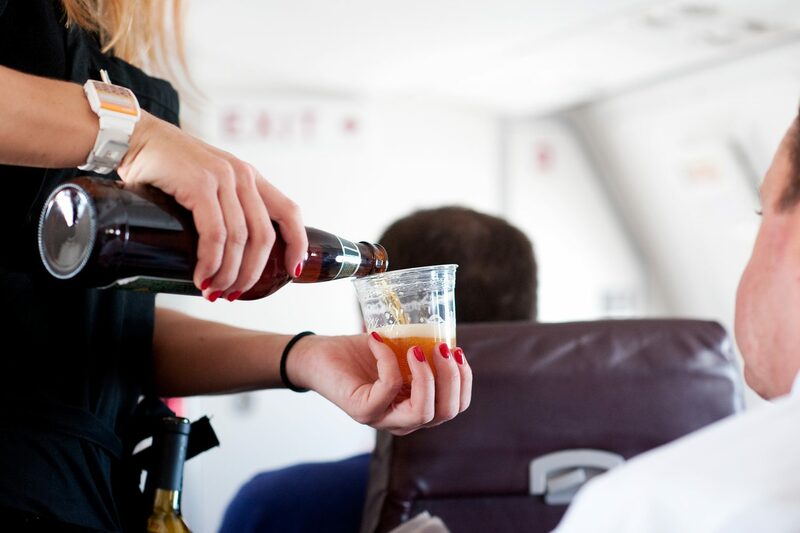 *Free microbrew and wine service is available to passengers 21 years and older on Q400 turboprop aircraft only. 4 comments on "35 years after first flight, Horizon Air still known for service (and free drinks*)"
Thank you Horizon for 35 years of safe flying. Love flying to PSC (Pasco) out of Sea (Seattle ) and PDX (Portland. Need more than 1 flight out of PDX. Horizon is down to earth friendly service and excellent customer service. You guys are great! I’m a loyal fan – thank you for the past 35 years – 25 of which I have been a part!